For the first time ever Hoe and Shovel is getting ready to plant a vegetable garden! Woo-hoo! For years – REALLY --years —I have dreamed of having a vegetable garden. My grandfather had a wonderful garden when I was growing up and that is where I got my first taste of home-grown, hand-picked, from-ground-to-stove-top yummyness. In the 24 years we have lived in this house I talked/dreamed of planting a veggie garden. For many reasons, some good – some understandable – some not so good—I’ve never done it. My framed beds are made. I’m not handy with a saw (neither is hubby - but for the record- he's good at so many other things) so I hired someone to make them. I designed them – the handyman put them together. I’m starting small (baby steps) with (2) 4x8 beds just to see how I fare with this adventure and there's room “to grow” – hee-hee. That's why I tucked them in the corner. He cleared the sod out first. Then he got busy making the frames. We used 2 x 6 cedar boards stacked on top of 2x4 cedar boards (turning them opposite at each end) and screwed (not nailed) together at the corners. This gives me a good 8-10” of height for each bed. I was really happy with the way they turned out. I placed them in a section of my side yard that is fenced - the fence is laden with confederate jasmine which will bloom its deliciously scented white flowers in the spring. The gate just beyond the beds leads out to my backyard. The fence was put in years ago when we had a dog. It isn't the prettiest fence or area of the garden but such potential awaits. I contemplated putting mulch around the perimeter of the beds but in the rest of my garden I use leaves and grass clippings for mulch- not cypress. So that wasn't a great option for me. I thought about putting stepping stones around it but naaaaa... that didn't really do anything for me. I decided on these crushed limestone rocks. It is a bit stark looking right now. Limestone rocks like these are used a lot in this area for xeriscaping. The advantage will be that the rocks will compact over time and weeds won't readily seed in it- it is 3 inches thick. I'm also thinking long term the rocks won't have to be replaced like mulch would. But for the record, I'm not loving it yet... I think because it is so barren and cold looking. Once plants and flowers are growing I will make a more fair assessment. I mixed blood meal and bone meal with the top layer of dirt for an organic fertilizer. We got a really good soaking rain to help the "beautiful" 3 yards of dirt I had delivered and had just transferred to the beds. I will let it all sit for a couple of weeks to get settled and "fixed" before I plant anything. I used part of the dirt in some other places in my yard to amend some existing beds. I'm crazy for dirt. The smell of it, the feel of it, the look of it... just makes you want to grow something pretty. Now let's see ....what will I be growing? I've ordered seeds for tomatos, beans, squash, cucumber, leeks and zucchini. They should be arriving any day. Somehow I forgot carrots - I will need to remedy that situation. Oh yes, and Zinnias. My first ever Zinnia seeds. I think Zinnias will add just the color I'll need to brighten up this corner garden. I should add a place to sit there too, don't you think? Now for the real truth. I have no idea what I'm doing. Some say start my seed in a tray, some say go ahead and put it in the ground and then thin out the plants. I'm going to keep reading and researching to get a good plan. I may break down and buy some plants since I might have waited a bit late to plant seeds. I'm just really happy I'm on my way to 'something' and I'll learn to do this just like I've learned to garden... through lots of trial and error. Any suggestions or tips are very welcome. You are off to a great start. I have no idea how your seasons go in Florida, but... I would go ahead and buy tomato plants (provided they are selling them now at the local garden centers) and plant the rest from seed. I've never grown leeks, so can't help you much with that. Vegetable gardening is a bit of trial and error, because it is different depending on where you are. But your beds look good, the soil looks good, now plant and see what happens! We get to watch your project grow and then not make the same mistakes ourselves. I think it will bring you tons of joy and bounty. Some things you are going to get loads of and others will be a dissapointment. But isn't all gardening that way. Good luck with it. Your raised beds look wonderful, so many possibilities. Zinnias are something we must have each year. We always direct sow outside, they like warm soil though. You will be happy to have the gravel, keeps things neater. Maybe you could put some containers of herbs around to soften the look? I have absolutely zero tips but here's a suggestion: enjoy it. Even if it bombs. Because every minute that you're out there, you're living a real-life dream that you've had for decades, AND you're connecting to your grandfather in a special way. For someone who says she has no idea what you're doing, you're off to a splendid start with these raised beds. It sounds to me like you've done everything right, and now comes the fun part. Don't worry--like Carol says, some things will do well and others won't. That's just gardening. It'll be fun to watch the progress over the coming months, too! Your raised beds look beautiful! I think you'll enjoy this experiment in the garden, and your tummy will thank you. Have fun! Your handyman did a great job on the raised beds! Maybe you could soften up the crushed stone with some containers of colorful flowers. Carol: Thanks for the encouragement. I like to cook with leeks so I thought I'd add them to the mix. We can pretty much buy veggie plants anytime in Florida so I'll take your suggestion about the tomatoes. anna: Gardening IS always that way. This type of gardening seems so daunting what with having to get things "just so". Maybe I'll find I'm wrong about that but that's sort of the way I've built it up in my mind. I will definitely be posting my progress. Ahhh... progress... the sound of that word is so positive. frances: I was thinking I would sow the Zinnias directly into the soil probably in the next couple of weeks although the soil still cools down at night after being warmed up during the day. Should I wait until the soil is warm at night too? mlm: as always- great advice and it is true- I feel I'll be bringing back a piece of my childhood memories with this endeavor. Jodi: I'm really good at making plans and designing- it is the actual "how-to" of vegetable gardening that I feel clueless. But I am determined to venture forth and make some mistakes along the way. I've been gardening by the seat of my pants all these wonderful years- this is just a new way of doing it. Thanks for the confidence. Susan: you are so right and you have inspired me since the start of my blogging days. I ordered some of the tomato seeds you suggested. Thanks. Robin: Thanks- I was happy with what he did and it took him no time at all. You and Frances are thinking the same thing I was- that's what I love about containers - they can be moved around in various suitable positions - just like furniture. Good luck with your veggie growing-I was a total newbie a few years ago myself. Here's my findings for our warm clime: tomatoes are better started in pots, and then transplanted, so you can bury the stem deeper and get stronger plants. Squash, zucchini, beans etc. direct seed. Throw in some seeds for herbs ( basil, dill, cilantro etc. as well as cloves of garlic for garlic greens) in between veggie plants in raised beds. These also help keep away insects. Can also get a crop of baby salad leafs while the tomatoes peppers etc grow large enough to need the room. 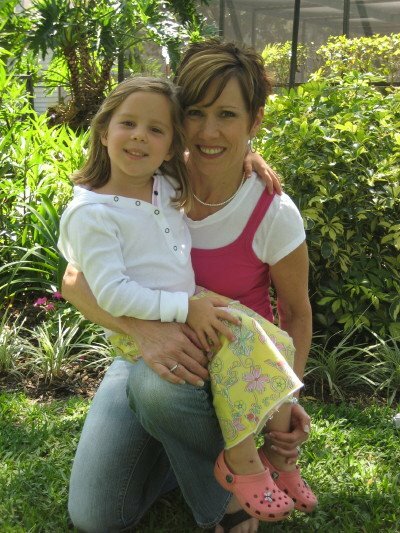 I just wanted to say that your posts are wonderful and brings back many memories of my youth trapezing up and down the state Being born and raised in Miami it is nice to see some familiar sites and places. It surely warms up this very snowy and cold Chicago winter we have been having. I love that you're putting flowers in your vegetable garden! Every year, I grow zinnias and TRY to grow marigolds with my veggies. (I've always heard that marigolds are a good companion for vegetables but frankly I've never have had a successful marigold crop). You'll love the zinnias - they love sun and heat (which you Floridians have an abundance of) and they're GREAT cutflowers. Marigolds do help ward off insects, but make sure you get the right variety. It's a good idea to buy the tomato plants from the nursery this time...and try one (or a few)varieties that are reliable, then try an heirloom...they're ugly, but gratifying. When the label says how tall they grow...believe it. They can get huge down here. Try beans...they germinate quickly and grow fast up a pole. It's good to start with at least a few things that you KNOW will be successful...and beans are one of them. Good luck and I look forward to watching the progress. your raised beds look great! i found your blog via carol's and I'm looking forward to reading it from the start. regarding zinnia, i direct sowed mine last year and they did really great. i waited really late (probably too late) to plant them but they did just fine. good luck! nicole: thanks a bunch for the gardening help. All your tips sound like a good start. I really appreciate your taking the time to help me... I need all I can get. Glenn: What a difference between Miami and Chicago! It must make you long for the tropics. Ldybug: what great help you are! I sure am grateful since I know you have managed growing veggies already. I'll keep you posted and I'm off to look for some tomato plants tomorrow. I love it!! I am going to make a veggie garden soon sometime. 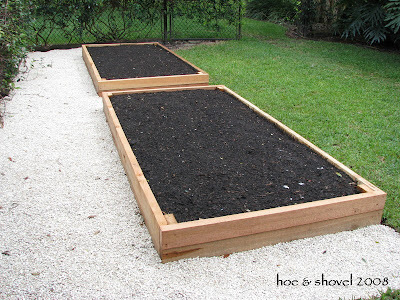 I would like a raised bed so I don't have to bend over so much. I always germinate my seeds in peat pellets so they don't go thru hardley any transplant shock as you do not have to disturb the rootball. Or you can use old toilet paper tubes. Since they are cardboard any 100% biodegradable just add some soil to them when seed sprouts bury the whole thing in the dirt. The cardboard will turn into dirt . Just make sure you bury all of the cardboard leaving none exposed as the water will evaporate from the exposed cardboard causing it to dry out much quicker. Good luck!! You are doing great! Aaron: thanks for stopping by and thanks especially for all the gardening tips. Yay for starting a veggie garden! Your raised beds are so pretty! They look bare now, but you'll have something beautiful and amazing soon. I'm really looking forward to updates on your progress! While I'm in no position to be giving you hints and tips from experience, I myself have been reading up on companion planting and jardin potager-style designs. This way apparently you get better crop yields, healthier plants, and a showier, prettier garden. The page can take a long time to load, but it's totally worth it. You might try the Florida Vegetable Gardening Guide put out by UF/IFAS. It has a table of both cool-season and warm-season crops that will work in Florida, including specific cultivar names. You can also call your local county Extension office and ask for their help. hanako: I can tell you have done your research. Thanks so much for the link. I am very interested in companion gardening... I bought some herbs yesterday for that purpose. It is so much to figure out but I know I will get there slowly. Thanks for visiting! Kim: Great advice and help, Thanks! I have looked at that site before and it IS very helpful. I appreciate your comment and thanks so much for stopping by Hoe and Shovel.